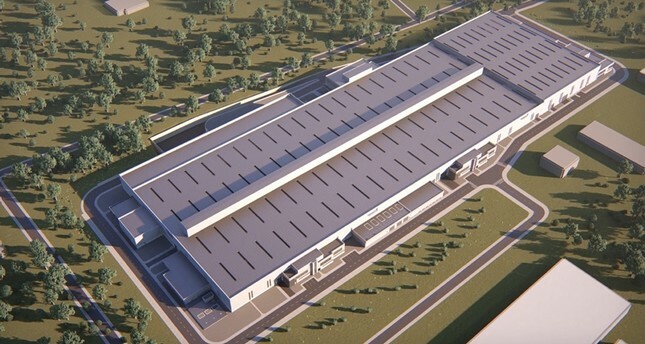 Turkey's leading aerospace engine designer and manufacturer will build the country's first and the world's fourth-largest composite plant under a single roof for the high technology production of structural aircraft parts. The $181 million facility will be built by Turkish Aerospace Industries (TAI) as 'a smart digital factory' on a 95,000 square meter area within the company's compound in capital Ankara's Kahramankazan district. Preparing its infrastructure for Industry 4.0, TAI will also develop products for global aviation giants such as Airbus and Boeing, as well as its own aircraft. The facility will produce structural parts of aerial vehicles, like airplanes and helicopters, and meet 2 percent of the world's air constructions composite needs. Besides high-level technological production, the facility will design and develop new products, while autonomous tools will be used in all operations to ensure high accuracy and efficiency. Augmented and Virtual Reality (AR and VR) will also aid in the production process. According to the type of composite, specialized robotic and autonomous equipment will allow precise and error-free production. Autonomous vehicles, robots and machines at the facility will be in constant communication with each other. The entire production process will be controlled continuously with thousands of sensors and communication systems. For example, paint shops will be operated autonomously by artificial intelligence, with no human contact whatsoever. The parts produced will be subjected to strenuous quality control processes with non-destructive testing methods such as ultrasonic and x-ray systems, and will later be mounted onto the aircraft. Composite materials such as fiberglass, carbon fiber, and fiber-reinforced matrix systems are widely used in the aircraft making industry. Composite materials and constituent materials together create a hybrid that has greatly improved the structural properties of aircraft. With this investment, TAI will greatly increase its production capacity and contribute to the national economy through exports. Founded in 1973, TAI is a joint venture of the Undersecretariat of Defense Industries and the Turkish Armed Forces Foundation. TAI produces and conducts modernization projects on F-16 fighter jets, both for the Turkish Air Force and its allies, along with training aircraft, unmanned aerial vehicles, and spacecraft electronic systems manufacturing. TAI also takes part in various military and civilian aircraft projects.